Kirkleatham was surrounded by defensive positions during the second world war, this ornamental tower from the now demolished Kirkleatham Hall was converted into a gun emplacement as part of the ring of nine pillboxes, four roadblocks, three anti-craft guns, minefields and three miles of anti-tank ditches. Sited at the entrance to Coatham Marsh. By Andy McKeown, along with the gates before you get there. This is one if the most obvious pillboxes in the area, sat in the middle of the beach and at high tides in the water. 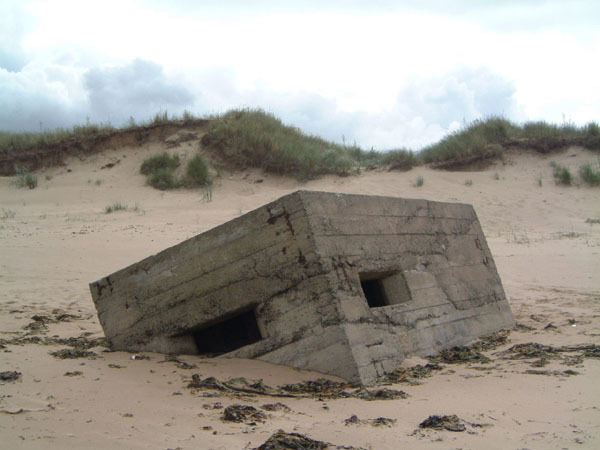 As of January 2007 its virtually submerged in sand, last year it was completely uncovered and actually tipped over the other way, see this pic on Freds Photos. I’m sure it will become uncovered again, its a real display of natural forces at work seeing this thing constantly change. A fantastic building hidden away in the woods, an 1876 fan house to draw fresh air through the mines, the fan inside was 30 feet diameter by 10 feet wide. Named “SS Castle” due to the wall ties. The layers of graffiti suggest its been a popular haunt for the junior drinkers of Eston and Lazenby for many years. The listed building entry calls this “Lovell Drift Fanhouse” but the origin of this is confused. The area was known various as Lazenby Pit / North Drift / Wilton Drift / Eston Quarry / Lowther Quarry bit never Lovell Drift, Lovell Hill is 1 mile to the east.